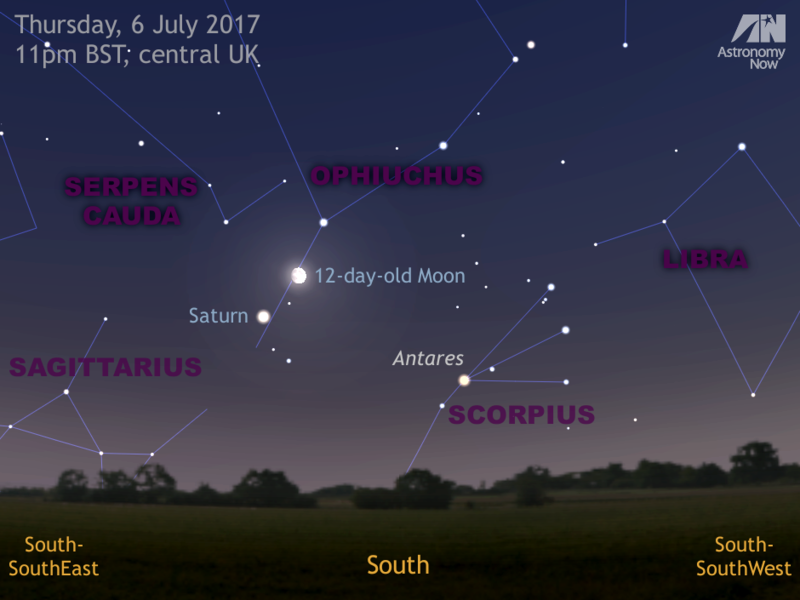 Late into the UK evening of Thursday 6 July, the rising 12-day-old waxing gibbous Moon lies just 3½ degrees to the upper right of Saturn, a conjunction perfectly framed in the field of view of a typical binocular. Saturn’s rings are easy to see at 50× magnification or more in a small telescope. The position of Titan, Saturn’s largest moon, is shown in the magnified view below. AN graphic by Ade Ashford. On the UK night of 6—7 July 2017, three weeks after the opposition of Saturn in the constellation of Ophiuchus, the ringed planet can be identified as the magnitude-zero ‘star’ highest in the southern UK sky around 11:40pm BST. As seen from the heart of the British Isles at this time, Saturn struggles to attain a peak altitude of just 14 degrees, or three-quarters of the span of an outstretched hand held at arm’s length above the horizon. While there is a slim chance that you can confuse Saturn with first-magnitude Antares in the constellation of Scorpius that lies 14 degrees (or one-and-a-half spans of a fist held at arm’s length) to the right of the planet, the supergiant star is the fainter of the two and has a reddish-orange hue in binoculars and small telescopes. This computer simulation depicts a high-power telescope view of Saturn and its brightest moons configured for 12am BST on Friday, 7 July. Titan, some 3,200 miles (5,150 kilometres) in diameter, is the planet’s largest natural satellite and its brightest at magnitude +9. Even the smallest telescope will reveal it 4½ ring diameters to the west of Saturn. Next brightest is magnitude +10 Rhea, Saturn’s second-largest moon at 930 miles across. In larger instruments, look for Tethys and Dione (magnitudes +10.7 and +10.9, respectively) closer to their parent planet, though the glare from the nearby Moon will make this a challenge. Note that this is an erect-image view: users of Newtonian/Dobsonian reflectors need to rotate this view 180 degrees to match the eyepiece view, while those using refractors, Maksutov- and Schmidt-Cassegrain telescopes with a star diagonal need to mirror the graphic left-right to match their eyepiece view. AN graphic by Ade Ashford. 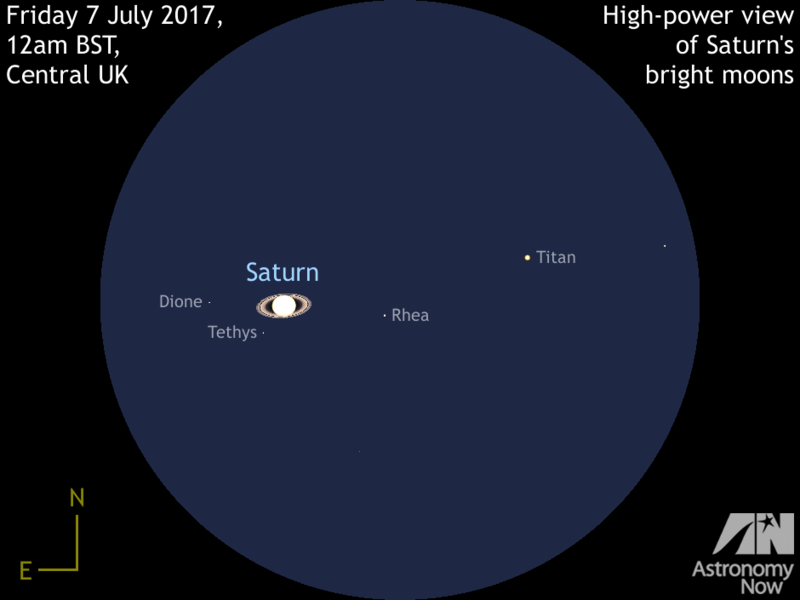 Returning to Saturn in a small telescope, the UK night of 6—7 July is ideal for spotting the ringed planet’s largest moon, Titan. This cloud-covered world some 3,200 miles in diameter looks just like a magnitude +9 star close to its greatest westerly elongation from Saturn, some 4½ ring diameters away. Titan orbits its parent planet every 16 days, so expect to see it a similar distance to the east of Saturn on 14 July. 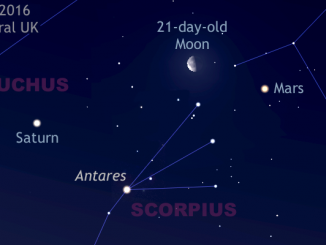 In the pre-dawn twilight of Tuesday, 1 March, the 21-day-old waning gibbous Moon acts as a convenient celestial guide to planets Saturn and Mars. 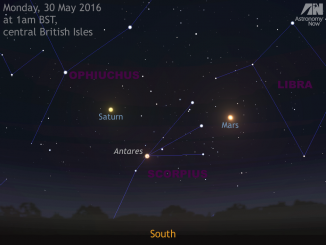 For observers in the centre of the British Isles, the best time to see this triple conjunction is shortly before 6am GMT, when the trio are highest in the sky to the south.